Photographer Katarzyna Majakdiscovered a whole new side of Poland when she set out to explore her own spirituality. Majak shared a few of these “women of power” with us. Check out more of her work at the Porter Contemporary Gallery. Over 90% of Poland is Catholic. Because of the country’s conservative values, many women pursue witchcraft and other pagan traditions as an outlet for an alternative spirituality. “The notations of the Celtic year belong to the Christian period, old style. If there are any traces of Pagan times they are only such as are to be gathered from a few names and ceremonies. The four seasons are known as earrach, spring, samhradh, summer, fogharadh, harvest, and geamhradh, winter….There can be no doubt the origins of the names belong to a period anterior to Christianity.” ~John Gregorson Campbell~Indeed earrach is derived from ear, meaning the head or front, also the east. Samhradh is from samh, the sun. Fogharadh is from fogh, meaning hospitality and abundance. Geamhradh is connected to geamhtach, meaning stiff, thick, binding, and thus sees tied-in with the idea of snow and ice. The ancient Ogham script (pronounced ‘oh-am’) is most often found on Ogham stones that date back to the third century. Most examples of the writing is found on Ogham stones of which there are over 350 found mostly in southern Ireland as well as in Scotland, the Isle of Man, Cornwall and Wales. The transition to the use of the Roman alphabet took place about the sixth century. 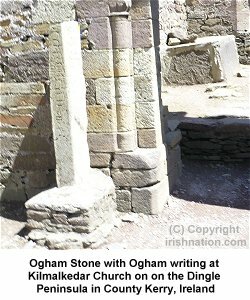 Most examples of Ogham writing confer the name of person that they represent, thus the stones are often memorial symbols.